Let me start by thanking those of you who have made these stories so popular over the past six months. This post is dedicated to you in gratitude. You have buoyed my confidence to continue along this path. This is how this series came to be. For the past few years, I have been a Special Education teacher to young children. Just a few years ago, while using social stories in integrated kindergarten classrooms with my students with autism, I noticed that their classmates were benefiting from them, too! The social stories I was using were written specifically for the child they were being used with, and parts of these stories had little relevance to their classmates. They seemed to be very interested in, and to find comfort in other parts of them. 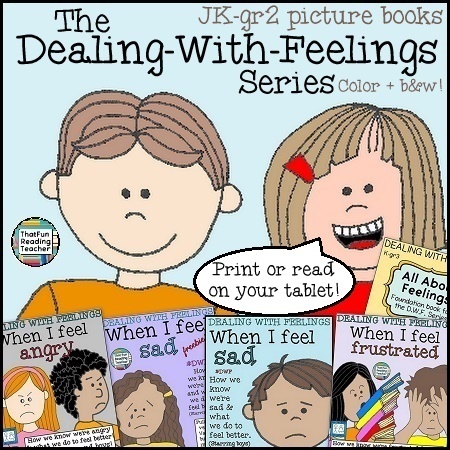 It occurred to me that many children could benefit from stories that were like social stories, but meant for more of a general audience of young children: Characters role-modeling the how-to’s of dealing with tricky feelings. (We all know how motivated we are when someone TELLS us how to handle something! )Even in kindergarten, some children were already uncomfortable about discussing feelings. Research, parenting, teaching and talking to each other tells us that natural conversation only comes from a willing participant, especially one who initiates it. Q: Where can one find kids who can naturally name and discuss a variety of feelings, involve other kids in the conversation without alienating them? A: In a picture books. 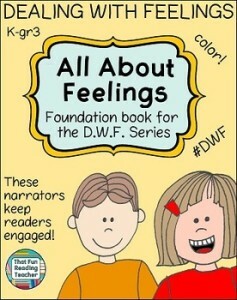 All About Feelings is the foundation story for the Dealing-With-Feelings Series. Child narrators introduce kids to a range of emotions by showing them examples of kids feeling them in various situations. I find myself turning to these stories more often recently. In September, there were a few sad little people who found comfort in reading about another boy or girl who was sad to say good-bye in the morning, too. When big kids kicked down snow forts and others were ‘stealing’ snowballs in January, reading about how kids dealt with anger was received a lot better than some of the strategies I’ve used in the past. Who knew that the phrase ‘use your words’ could result in an airborne chair? When the temperatures took a dive resulting in clusters of indoor recesses, well, let’s just say that it wasn’t only students benefiting from the When I Feel Frustrated books. What feelings would you like to see dealt with in upcoming books? What are some strategies that you think should be included? Thank you to Rebekah Brock, whose clip art brought these stories alive!